Parasites Like Us by Adam Johnson is super funny and amazing since it involves an anthropology professor. To make it even better it is based in South Dakota, which for me makes it more home. It about Clovis and how one of his grad students is only using Clovis/prehistorical method of living for a whole year for his thesis. Which is amazing if someone really would do this but also funny to read and image yourself killing squirrels on campus to eat and make rope out of. They find a new “site” and it it just turnes into crazy. But at the end it makes you think. Johnson did a good job and it was nice to read something anthropology even in novel form for once. It was a fun read. So I finished reading another great book by Daniel Quinn and well it made me think, wonder, ponder and hope I can read more books from him. He is soon becoming one of my favorite authors and starting to get me really to think. 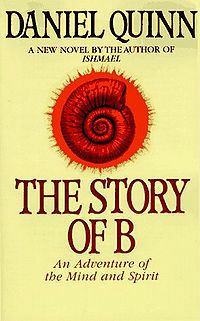 So read…The Story of B. Read it with an open mind, and time to ponder and really I mean REALLY think about it all.